A blend of heart-healthy avocado oil, vinegar, and zesty herbs and spices make PRIMAL KITCHEN® Green Goddess Dressing the perfect marinade for chicken. Chives, tarragon, parsley, savory and rosemary, plus black pepper and garlic, turn plain chicken breasts into a sensational meal. All you have to do is twist off the lid and pour on the flavor. 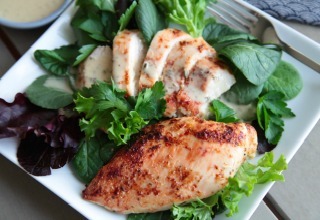 Green Goddess dressing isn’t the only secret weapon PRIMAL KITCHEN® is wielding against bland, dry chicken. The other secret ingredient in this marinade is PRIMAL KITCHEN® Mayo. Whisked into any chicken marinade, mayonnaise adds fat and flavor, two things that boneless, skinless chicken breasts can always use more of. 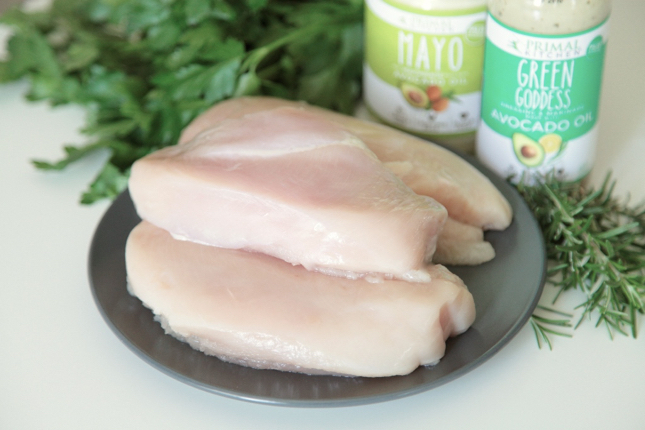 Mayo coats the chicken, locking in flavor and moisture and turning out chicken breasts that are tender and flavorful. 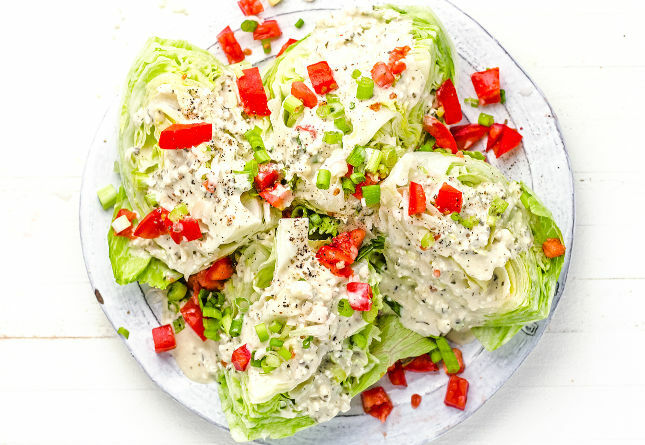 For an easy lunch or dinner, slice this green goddess chicken over a salad and top with more PRIMAL KITCHEN® Green Goddess Dressing (of course!). 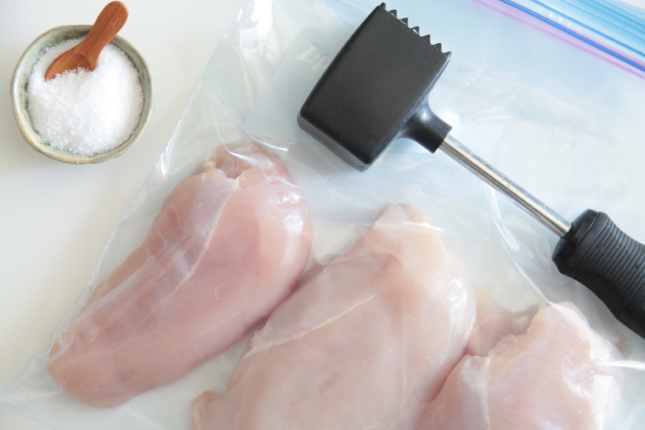 Pound the chicken breasts to uniform thickness. The easiest way to do this is to put the chicken in a resealable plastic bag, then use a meat pounder or rolling pin to even out the thickness of the chicken. 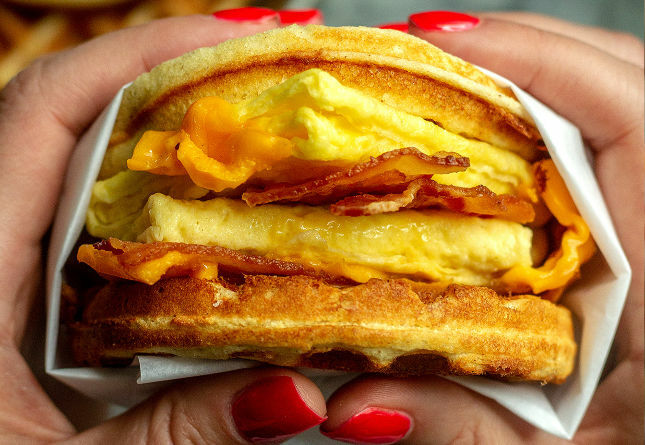 Aim to make the whole breast about ¾-inch thick. Whisk together the PRIMAL KITCHEN® Green Goddess Dressing and Mayo. In the same resealable plastic bag used to pound the chicken, pour the marinade over the chicken. Seal the bag and marinate at least 4 hours and up to 12 hours. Preheat oven to 450º F/232º C, or heat a grill (clean and oiled) to medium-high. Take the chicken breasts out of the marinade and use a paper towel to blot excess marinade off the meat. If grilling, cook the chicken for approximately 6 minutes per side, or until an instant-read thermometer inserted in the thickest part registers 160º F/71º C to 165º F/74º C.
If baking, spread chicken out on a rimmed baking sheet. Bake 20 to 25 minutes, or until an instant-read thermometer inserted in the thickest part of the thigh registers 160º to 165°. To brown the outside, turn off the oven and turn on the broiler (placing the baking sheet directly below) for the last 5 to 7 minutes of cooking. Let the breasts cool 10 minutes before slicing. Green Goddess chicken is delicious served warm or cold. 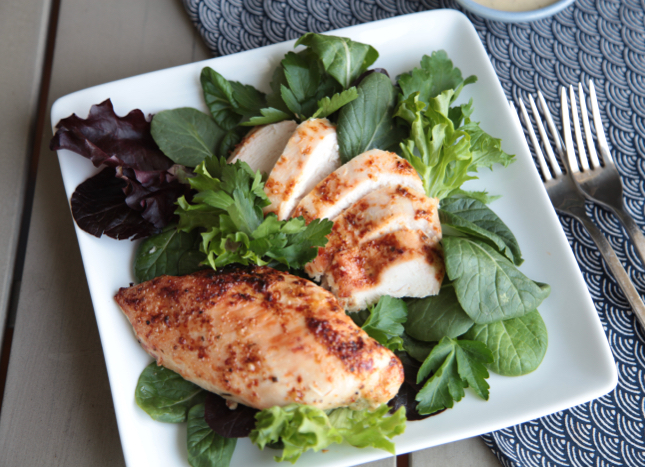 Lay the chicken over salad greens and pour PRIMAL KITCHEN® Green Goddess Dressing on top. < Previous postSuccess Story Follow-up: It’s about a Healthy, Real Life! 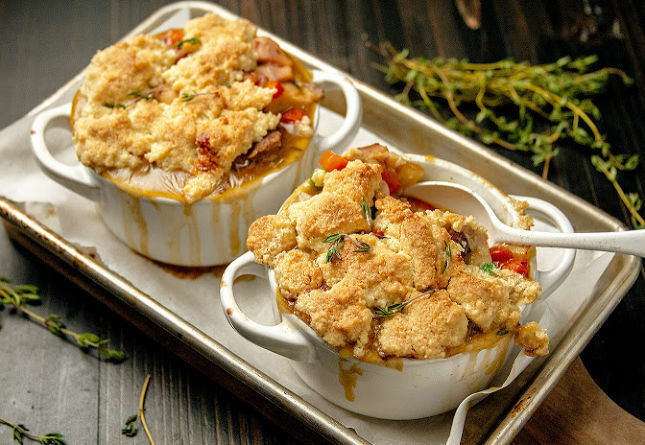 What a tasty looking chicken dish … can’t wait to try this one out! Looks delish. I’m not sure that the chicken needs to be boneless and skinless, however. Bone-in chicken with its skin is usually juicier and more flavorful. Might have to fry the chix briefly to crisp the skin, then apply the yummy-sounding spread and finish in the oven. Sounds great! 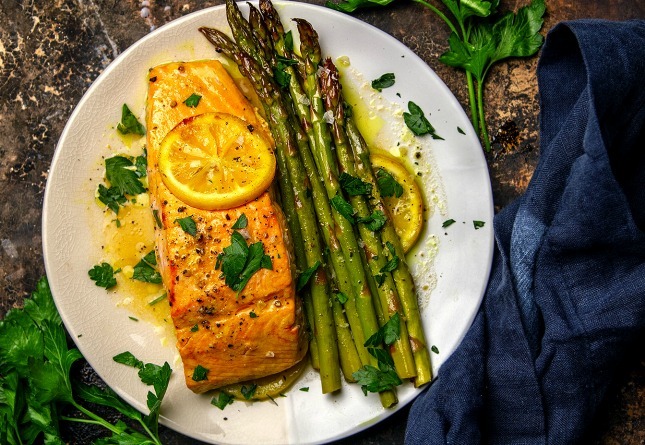 The honey mustard vinagrette makes a great marinade for salmon, and I was going to try using the Greek one on chicken. Makes life easy! Looks good but since I’ve changed my diet, I found my self eating less and less chicken (down to once a month and less) and more red meat, in contrast to the time before, when chicken breast (Schnitzel in particular) was a staple. I am carious to know how many of you experienced the same. Thanks! Linda, I’m always grateful to my readers for catching what my team and I sometimes miss! This one gave me a good laugh. Thanks for the heads up! A healthy lifestyle is important and I think some chicken and a good sauce can help in it. This looks wonderful. Definitely trying this recipe out this week – I’m just on making my meal plan. Thanks! What a beautifully executed dish. Can anyone tell me where I get good quality Wakame in Dubai.. Thanks for this lovely recipe.